Rajasthan Board of Secondary Education (BSER) has organized the “Varishtha Upadhayay Pariksha (10+2) (Sanskrit Shiksha)” examination from 8th March to 2nd April. This test has been organized by many of the aspirants who have finished the 10+2 with Sanskrit Shiksha. As per reports, this year 4,760 candidates have competed for the Rajasthan Varishtha Upadhyay examination this year. All the hopefuls waiting for Rajasthan 12th Varishtha Upadhyay result 2018 can check the result from today, 1st June. The Rajasthan Varishtha Upadhayay Pariksha (10+2) (Sanskrit Shiksha) result will be accessible to download on Rajasthan Board official website, rajeduboard.rajasthan.gov.in. students appeared for 12th Varishta Upadhyay examination can also check the cutoff marks along with the results. 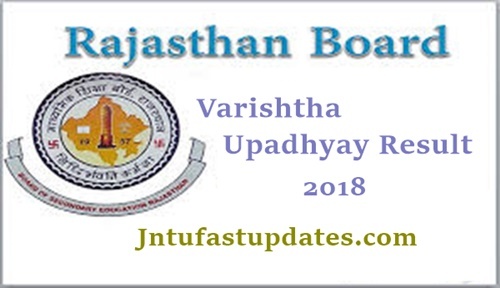 Rajasthan Varishtha Upadhyay Result 2018 :Board of Secondary Education Rajasthan is the state level educational department which monitors the secondary and higher secondary education in the state. More than 6000 schools in 32 districts working under BSER. The organization annually organizes various secondary and higher secondary classes examinations. Along with the regular examinations, the board also conducts the yearly tests like Rajasthan 12th Varishtha Upadhyay and Rajasthan Praveshika at 10th level. Many of the competitors are going to compete for this examination annually. This year more than 4K aspirants have enrolled and appeared for the examination. As per the reports, the pass rate is 85.79% last year. Among them, 86.34% are the regular students while pass percentage of students who opted for distant learning was 50.34%. The girls pass rate is more than that of boys last year. The girls pass rate was 87.16% compared to 84.33% pass percentage of boys. The Rajasthan Education Board expecting the higher pass percentage this year than the last year. The Rajasthan Varishtha Upadhyay 10+2 (Sanskrit Shiksha) Result 2018 is slated to release on 1st June 2018 as per examresults.net. Candidates competed for the test can check the result from the official website, rajresults.nic.in or from the BSER official website, rajeduboard.rajasthan.gov.in. Students can download Rajasthan 12th Varishtha Upadhyay Result from Manabadi.com also. Students can get the result through any of the websites mentioned here. Also, they can check the score, cutoff marks, and other details from these websites. Students can check RBSE 12th Varishtha Upadhyay Result 2018 Namewise, SchoolWise results from the Rajasthan Board results website, rajresults.nic.in or from rajeduboard.rajasthan.gov.in. The results will also be accessible district-wise. Students can check the results in their interesting format. Select Name Wise and Roll number wise Result download option. For Name Wise Result – Enter your name and father’s name (at least three letters of each name) & click on get result.